Please note that there is no Division 3 match report this week due to a forfeit. The early afternoon saw travelers welcomed back and a chorus of “Happy Birthdays” for the beloved Sarah-Rose. A rich sideline of wonderful supporters lined the ground with a strong string of red and white. The sun shone and the wind was softly blowing down field. The Bloods won the toss and we were on the field kicking into the wind. Despite being on the unfamiliar Mentone turf, the mood was positive and a sense of fortuity was in the air. The girls took the ground with confidence resting on a solid warm-up, a previous win against St Bedes and a 6-strong bench. The first quarter was fiercely fought, with the ball moving down both ends of the ground before the Bloods notched the first score of the match. Another sprayed shot for goal and the Bloods were applying the pressure. 0-2 remained the score for several minutes until number 64, R. de Koning snapped her first for the match. Bloods celebration, but heads were kept level. Cool, calm and collected the Bloods stormed into the second quarter with another two goals from G. Reynolds and R. De Koning. The General, M.Johansen leading the defensive line with an almighty contested mark settled the troops. C.Peters returned to the ground after a spell on the injury bench, and was relentless in bravery, personifying the meaning of “putting one’s body on the line”. The valor of the captain was mirrored by E.Johnson and L.Hall, smashing through packs applying consistent pressure down the ground. 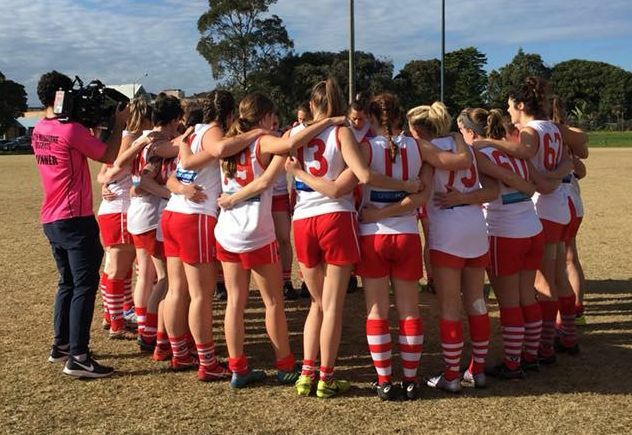 Despite a quick one-goal answer from St Bedes, the Bloods had made their mark. At the start of the third quarter it started to unravel for the Bloods. The ground felt a little harder, the sky a little cloudier and key St Bedes players stood a little taller. The Sobey-Johansen-Reynolds halfback line fell apart and St Bedes swarmed the Bloods defensive 50. The mood became dire. Gallant goal-saving efforts from M.Brydon, M.Mackey and E.Mace left a soccer-like feel to the match. Onerous repelling the ball out of the defensive 50 resulted in lackluster play, sending the ball straight back into the waiting hands of St Bedes players. Tempers flared, altercations ensued like spot fires and the sound of the siren at the end of the third quarter was a relief; the Bloods clinging to a slim 2-point lead. Optimism that the break in play would stem the bleeding was in vain. Rattled by the third-quarter series of undisciplined behaviour, the Bloods were left reeling and the fourth quarter remained scoreless, paralleling the third. The pent-up ferocity of T.Bowe, K Jaegar, F.Adinata and M.Koulanginis was unleashed in the dying minutes as St Bedes added insult to injury, heaping on a solid 4-goal final quarter. The Bloods can rest on the solid work of the prior home and away season that has secured a 2018 finals berth. A week of reflection on focus, role and pride as we armor up for a repeat of the match against St Bedes; lessons learnt, ready to come out on top as the better team.